A recently restored Cold War aircraft has made an emergency landing after a fire alert during test flights. 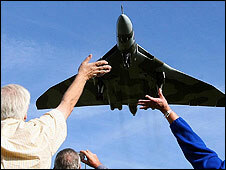 The Vulcan bomber had undergone years of restoration at Bruntingthorpe air field in Leicestershire. It was on the first day of flying tests at RAF Cottesmore in Rutland when the crew saw a fire alert, issued a mayday and landed the aircraft. But volunteers from the project said there was no fire and the alarm was probably an electrical fault. It is not yet clear whether further planned test flights will be affected. Pilot David Thomas said engineers would give the aircraft a thorough examination. "We have had a look at the aircraft and it does appear it was a false indication. "So they will clean out the inside of the engine, do some checks and make sure all the warning wiring is intact." The Vulcan was originally based at RAF Cottesmore but last flew operationally 15 years ago. The organisers said recent donations of £150,000 would pay for the flights. Some 20,000 people worldwide have helped contribute to the restoration of the Cold War bomber - with £2.7m contributed by the Heritage Lottery Fund. The test flights will determine if the aeroplane is ready to apply to the Civil Aviation Authority for a "permit to fly" so it can perform during the air show season.